Today is, so to speak, a “patronal feast” of this blog, since this is one of three times in the two-year Daily Office lectionary that Hebrews 6:19 is read. We have this hope, a sure and steadfast anchor of the soul. The name was first used as a tongue-in-cheek description following a retreat for newly-ordained GenX clergy held at the DeKoven Center in Racine, Wisconsin many (increasingly many) years ago. Dave Walker’s “Cartoon Church” from the Church Times paints a pretty good picture of what we were up against. That expectation of piety, coupled with virtually no exposure to the Offices (how often does *your* church have Evensong, huh? ), we all experienced as an anchor dragging us down. Being a card-carrying member of the “Daily Office Anchor Society” was not really a good thing. 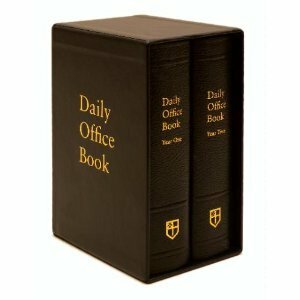 The leather-bound, slipcased Daily Office Book, displayed on our shelves but rarely used, became a visible symbol of our failure to meet expectations — other people’s expectations, the Church’s expectations, and our own. These days, nearly 20 years later, I no longer feel that the Daily Office represents a weight of expectation, a letter of law or institutional requirement against which I am judged. Praying the Daily Office is instead a portable practice (I use a leather-bound BCP and Bible, but you could use the Forward Day by Day app on your iPhone) that allows me to participate in the Church’s ceaseless prayer and to “travel light” like the seventy disciples that Jesus sent out in today’s Gospel passage. There is a sense of lightness, I think, that is the fruit of time spent in Jesus’ presence. The seventy found, even though they had no supplies (no buildings, no tools, none of the stuff we usually haul around with us), that their relationship with Jesus was enough — and more than enough. It’s this sense of lightness, I think, that the recent Memorial to the Church seeks to recall us to. To recommit itself to the spiritual disciplines [Daily Office, Eucharist, etc.] at the core of our common life, to go into our neighborhoods boldly with church planters and church revitalizers, and to restructure our church for the mission God is laying before us today. I have found in my own life, through experiences of loss and grace and through practices of recovery that build hope — what Richard Rohr calls the “coded Gospel” — that my relationship with Jesus is enough. The Daily Office, for me, is the way I spend time in Jesus’ presence most mornings so that for the rest of the day I can travel lightly into my neighborhood and hold lightly my expectations about what success looks like. In this way, the Office serves me as a “sure and steadfast anchor” connecting me to Jesus, who is my hope. How do you stay connected to Jesus? What builds hope in your life? What helps you to set aside expectations and find that you have enough, and more than enough? This entry was posted in Daily Office, Easter and tagged anchor, disciples, Hebrews, Luke, Seventy, steadfast, sure, traveling light on May 19, 2015 by Rodger Patience.